oatmeal make up this soap. reconned with as it is full of antioxidants and numerous health benefits. 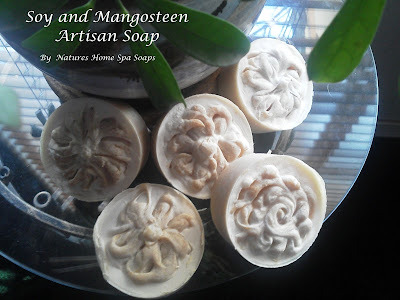 The scent it contributed to this soy milk soap is subtle, and fruity. I colored it naturally with a bit of paprika. And added a TBL of finely ground oatmeal as a skin loving soother. Beautiful soaps. Have heard of mangosteen, but never seen one. Kirppu, thanks for stopping by! 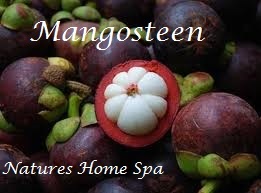 Mangosteen is a new adventure for me too! Hi Jan, yes these smell sweet, almost like a fermented mango scent. Subtle. I like it. I'm heading out to Tombstone Az in a week for the kids birthday outing. Ever been there? Great job Anna! Are they CP or HP? Looks like CP.....you are doing good! Looks wonderful! Val, thanks. They are cold process. Dear Anna, your mango star looks wonderful aus.Tolle images. I will make time today some photos of our home in the snow and send it to you. We have soooo much snow. ;) This is a white Easter. I think very often of you and hope it goes well eucht. I wish you and your family a happy Easter. Let it be with you well. Doreen, I will look forward to seeing your snowy Easter pictures! Weather here in Arizona in like Spring! Our apple tree and peach tree have blossoms, beautiful. I will send pictures thru email to you. Love to all, have a happy, blessed Easter.